“You mean salad pizza?” I asked, spring breeze whipping our hair back. I couldn’t believe she was thinking about dinner. Not only was there so much else to think about — that grand pair of egrets standing tall in the reeds for starters — but we were riding off an absolute marathon lunch from our favorite Lowcountry Charleston restaurant, Hominy Grill. It was the last day of vacation (Andy had left the day before) and we had christened it the “leave it all on the field” lunch. As such, there was pimento cheese, country ham, boiled peanuts, mile-high biscuits, grits, fried chicken, fried green tomatoes with ranch, macaroni and cheese, fried catfish sandwich. 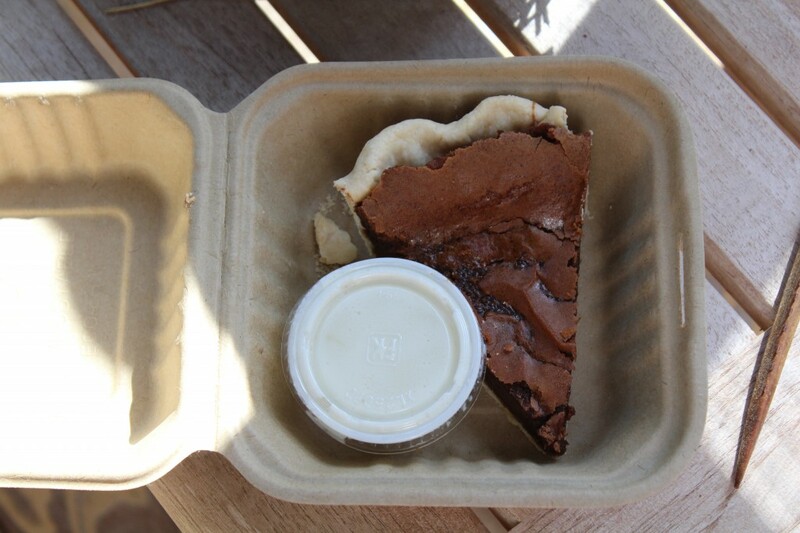 We bought two slices of their chocolate chess pie to go because we thought we were too full, only to devour an entire slice in the takeout container as we waited for the server to run my credit card. But she was her mother’s daughter, I guess, so dinner was on her mind. “—out of pizza dough?” I added. We were right near the market, and realized that everything we needed for the meal would fit in my bike basket: pizza dough, tomatoes, greens, little bocconcini balls. We already had dressing ingredients. As much as I love making dinner, I will tell you what I do not what to be doing on my last night of vacation, when it’s near 80 degrees and there’s a beach bike ride beckoning us at all times of day: Spending too much time in my kitchen. We made a pitstop at the house so the pizza dough could warm up on the counter while we continued riding. 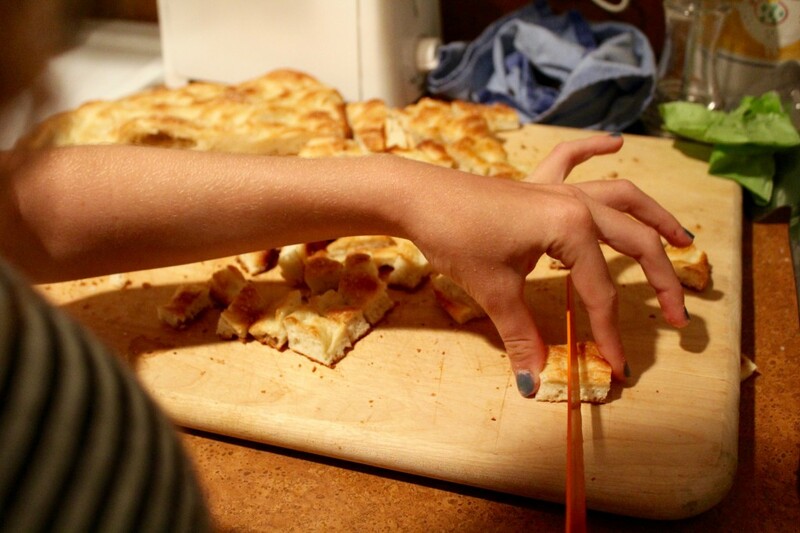 Later, it took about 20 minutes to put together the meal, roughly the amount of time it took to bake the dough into focaccia croutons. 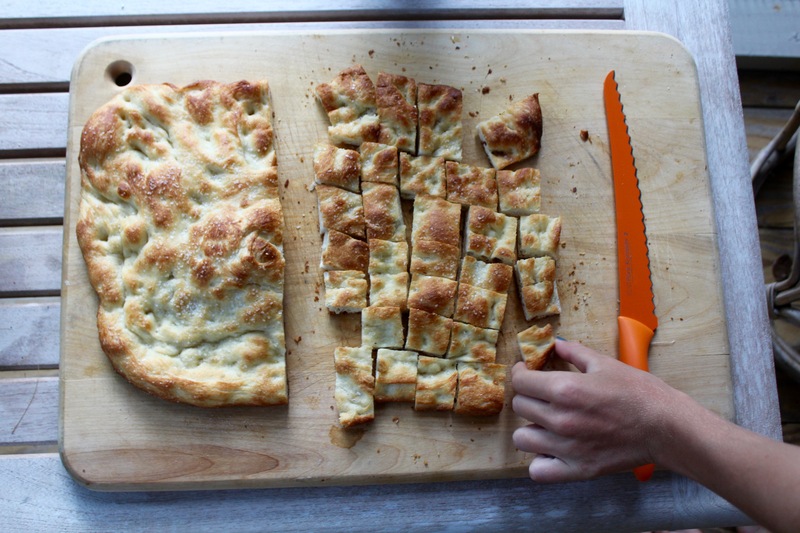 Because that’s what you’re making when you bake pizza crust with a boatload of olive oil and no toppings: Focaccia. Naturally, Abby had some strong opinions about the croutons. Mom, you want to make sure they’re smaller, bite-size. The idea is to get a taste of everything on one fork. You are 100% correct, I told her. Even smaller, she said. At a certain point she had to take things into her own hands. I would understand if you bookmarked this until tomatoes are in season. But that’s an awful long time to wait. Serves 4. Place pizza dough in a bowl and let sit on counter for about two hours before you want to make dinner. Preheat oven to 450°F. 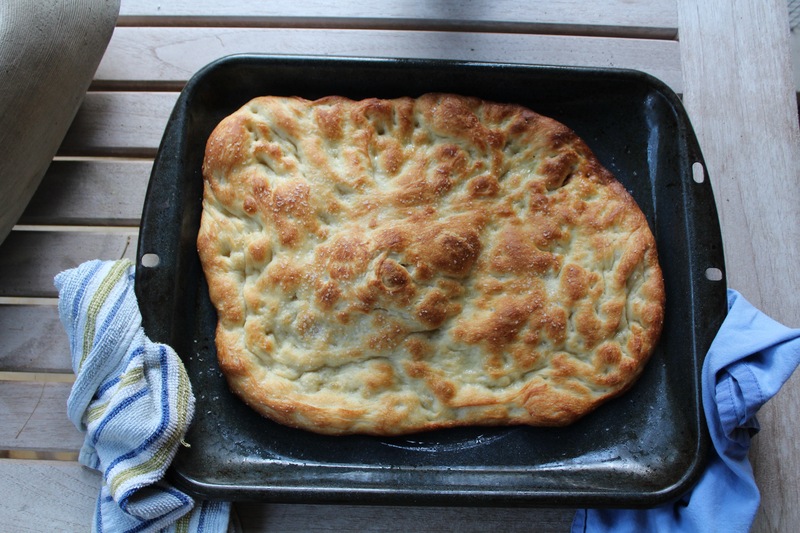 Brush half of olive oil on a rimmed cookie sheet, then press pizza dough flat so it stretches to the corners — or as close to the corners as possible. Brush with remaining olive oil and, using your fingers, press dimples into the surface. (I didn’t do this, but you can.) Sprinkle with sea salt. Bake 15 minutes until it looks a little browner than gold. (I was after a little crunch.) Remove, let cool, then chop into bite size pieces. 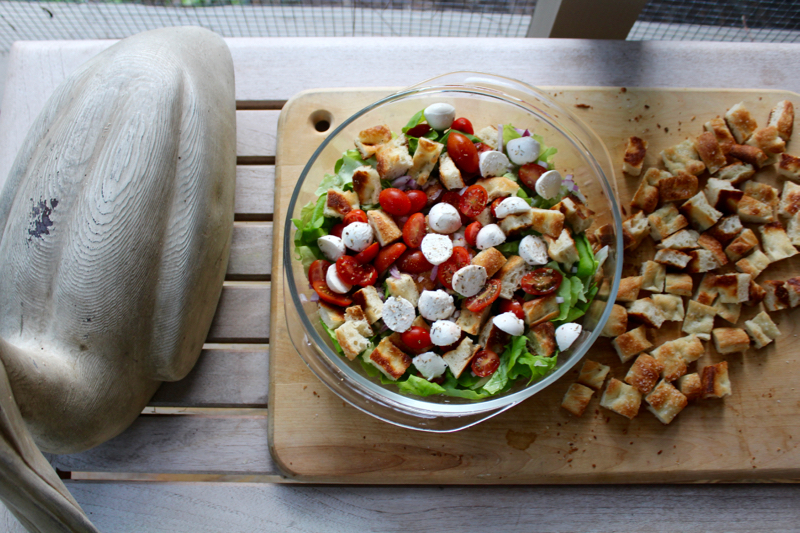 Meanwhile, while focaccia bakes, add lettuce, tomatoes, onion, and bocconcini to a bowl. In a separate container, whisk together red wine, olive oil, oregano, salt and pepper. 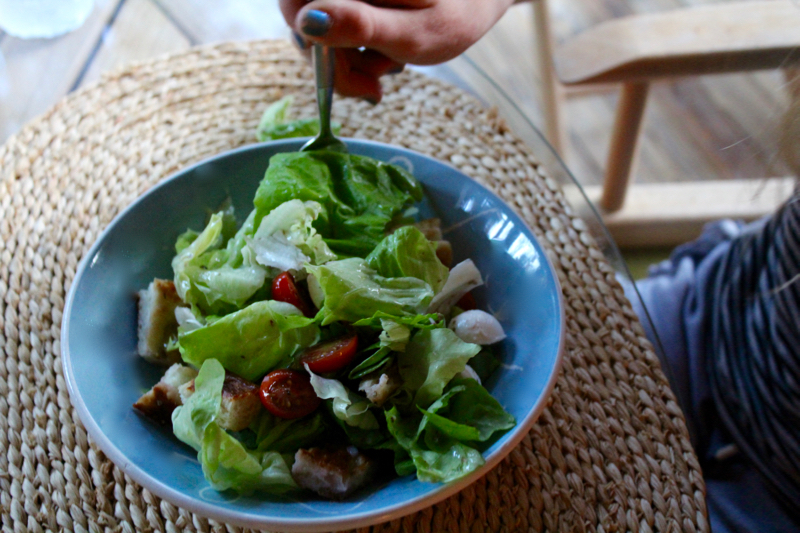 After focaccia croutons have cooled a bit, add them to the bowl. Drizzle vinaigrette on top and toss everything together. Top with Parm and basil if using. Serve. In the Apropos of Nothing Department: We had a beach picnic the night before — I grilled some chicken, packed a few salads, made a Gin & Tonic roadie for myself in a martini shaker. As I’ve written before, usually I dread eating on the beach (it’s one of those things that sounds so much better in theory than in practice) but this one was excellent. We stayed almost until the sun went down. We had a Kiawah Island vacation years ago for my parent’s 40th anniversary. One for the books, indeed. The thing I love about coming here, is that even if we can’t have exactly what you post (food allergies), it Sparks my imagination and I can tweak as we need. Thank you! Made this for dinner tonight, and it was wonderful! Thanks for such an easy weeknight recipe. 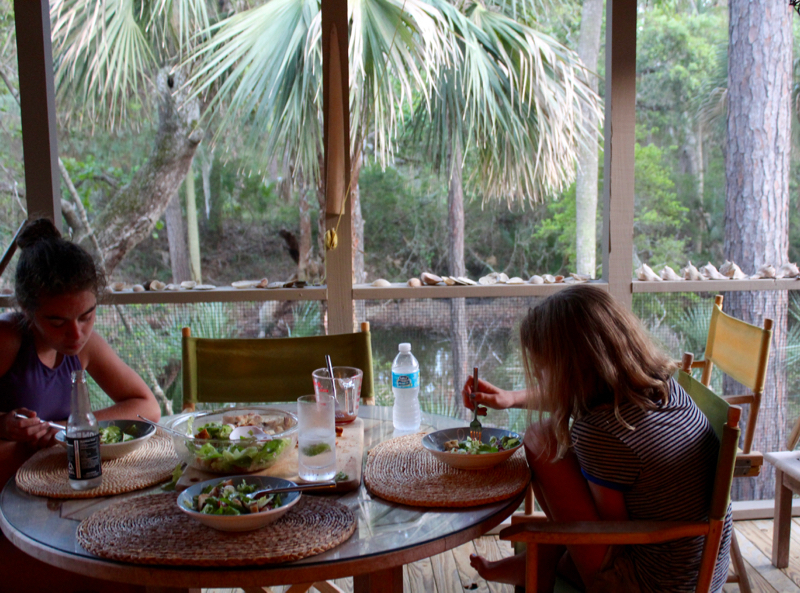 Love the idea of making some meals on vacation, and appreciated that section of your Celebrate Everything book. Just curious about the logistics. Yummy idea! I’d add some cubed or julienned salami and maybe some pepperoncinis. yes, that is a very good idea Wendy! How long do you think the croutons will keep? Would it be better to keep it as bread and then chop it up closer to when it would be used? It would probably keep for a day or two — and sure, chop up closer to when used. I don’t think there are any hard and fast rules with this kind of thing. This is brilliant and definitely a salad I could sell to my teenage sons… but I may have to add some sliced salami or pepperoni to really appease them. Ha! We drove from Toronto to Seabrook Island (18 hours!) a few years ago and never looked back. It’s been yearly vacations in the Carolinas every since, and we look forward to returning soon. I definitely gave in and bought corn, zucchini, AND tomatoes this week (so impatient for summer produce! ), so you better believe I won’t be waiting to make this! Made this for dinner last night – it was so good! I added some chopped pepperoni, mushrooms, bell pepper, and red pepper flakes. 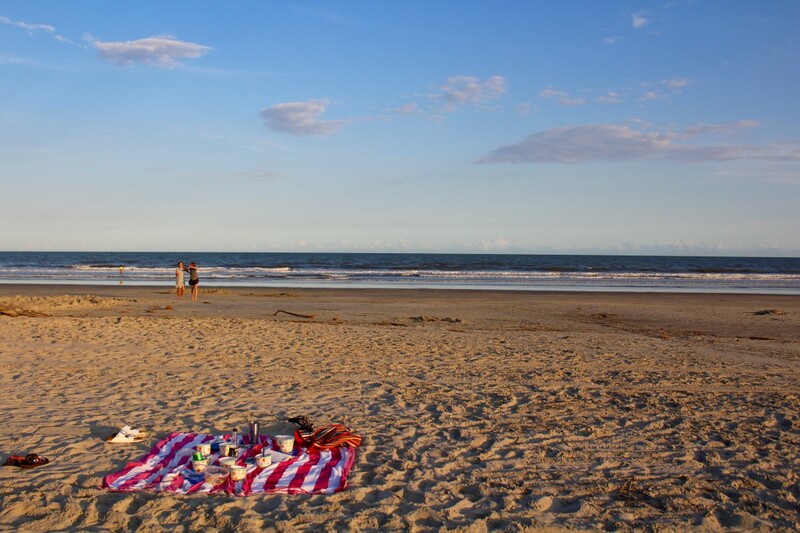 We usually go to Hilton Head but this looks divine. We are going to do this recipe this summer definitely! This is AWESOME. I must make this very soon. And I adore Hominy Grill. Oh, everything about it. The desserts. The jalapeno hush puppies. The SHRIMP AND GRITS. Sigh. Now I need to go back! I’m reading this as the rain is falling softly on the roof. And a beach picnic sounds so nice. Add that to my Summer to-do list. I enjoy your blog so much. So looking forward to your book. I made this today for lunch, it ended up being a little more panzanella than salad, but was super delicious. I definitely plan on making it all summer long — especially when we start getting tomatoes! Made this tonight when I made pizza for dinner. Great, refreshing salad after the heat of baking pizzas in August in Tucson. A big plate of salad helped me not eat so much pizza.